This amazing tropical stinkhorn features a long and elaborate "skirt." 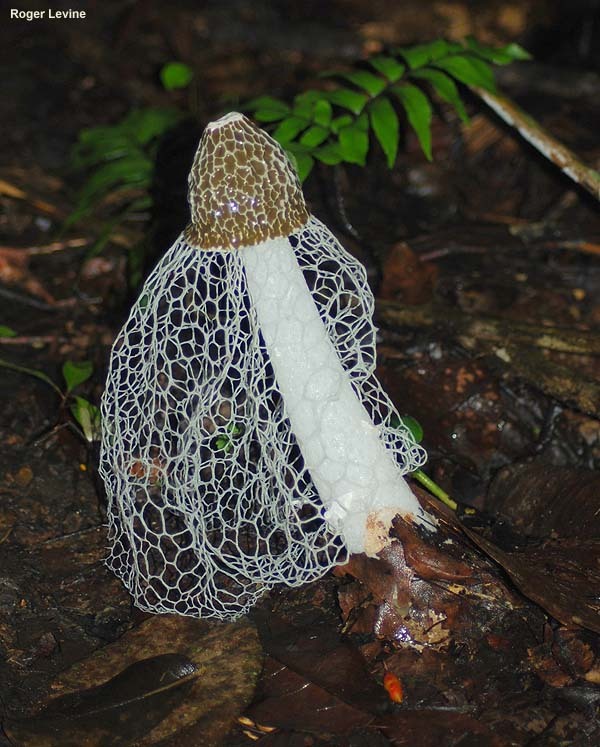 In North America, it is found in the southern provinces of Mexico; northward it is replaced by the short-skirted Phallus duplicatus. 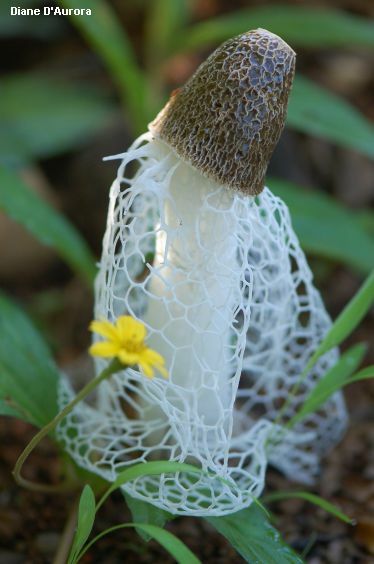 Readers who have seen the Discovery Channel's Planet Earth series may remember the stunning time-lapse photography sequences of Phallus indusiatus rising from the ground, then gracefully extending its net-like skirt. Similar species with colored skirts include Phallus cinnabarinus (with a red to orange skirt) and Phallus multicolor (with a somewhat shortened, yellow skirt). 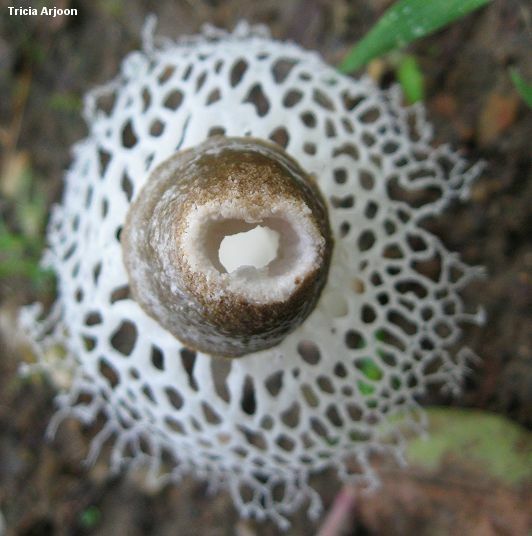 To judge from illustrations in Guzmán, Montoya & Bandala (1990), the former occurs in Mexico--but records of yellow-skirted stinkhorns from Mexico may simply represent specimens of Phallus indusiatus with slightly yellowish skirts, or skirts that have yellowed with age. Dictyophora indusiata is a synonym. 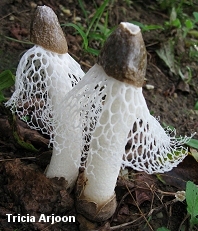 Ecology: Saprobic; growing alone or gregariously in woods, especially in disturbed-ground areas (ditches, paths, road sides, and so on); also common in urban settings; year-round; distributed in North America from roughly the 24th parallel southward (southern Mexico); also common throughout the tropics, nearly world-wide. 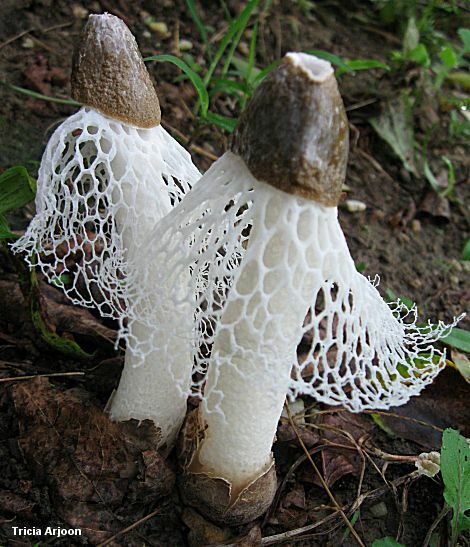 Immature Fruiting Body: Like a whitish, brownish, or purplish "egg"; when sliced revealing the stinkhorn-to-be encased in a gelatinous substance. 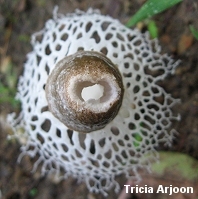 Mature Fruiting Body: Spike-like; to 25 cm high; with a cap that is smooth at first but pitted and ridged by maturity, and covered with a slimy, olive-brown substance that eventually wears off (or is carried away by flies), exposing a whitish to light brown surface; usually developing a perforation at the top; with a white stem that arises from a white, sacklike volva; with a laced, white to slightly pinkish "skirt" hanging up to 15 cm from the bottom edge of the cap; odor unpleasant or strongly sweet. Microscopic Features: Spores 2.5-3.5 x 1-1.5 µ; long-elliptical to nearly cylindric. REFERENCES: Ventenat, 1798. (Persoon, 1801; Saccardo, 1888; Lloyd, 1909; Cunningham, 1944/1979; Dring, 1964; Arora, 1986; Guzmán, Montoya & Bandala, 1990; Calonge, 2005; Calonge et al., 2005.) I have not collected this mushroom.